No. 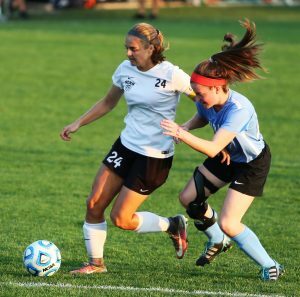 1-ranked Penn defeated South Bend Adams, 3-0, on Tuesday, Sept. 26, to clinch a share of the Northern Indiana Conference Girls Soccer Championship. Penn can wrap up the NIC crown outright on Thursday, Sept. 28, at Glenn. Adams tested the Kingsmen early, but Penn broke through in the 65th minute with an unassisted goal by Kristina Lynch. Lynch made it 2-0 in the 74th minute off an assist by Maya Lacognato. Kelsi Carrico scored off an assist from Lynch to make it 3-0 in the 74th minute. The Kingsmen continue their amazing perfect run, moving to 15-0-1 overall and 8-0 in NIC play.